The top seeded duo of Alex Robinson and Ben Foss will compete against the 4th seeded pairing of Joseph Bourgaize and Stuart Sarre (pictured) in the final. Robinson and Foss dropped an end during their 5 game quarter final win over Luke Bichard and Dan Collenette, but eased past Daisy Kershaw and Cleo Rosumek 4-0 in the semi finals. Kershaw and Rosumek had earlier completed a shock 4-0 win over 3rd seeds Chloe Le Tissier and Charlotte Casey. 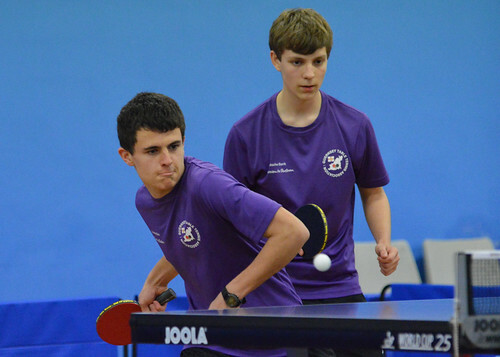 Bourgaize and Sarre then went on to complete a surprise win of their own due to their 4-1 win over the 2nd seeds Ryan Bichard and Matthew Casey at the semi final stage. Top seed Chas Elliott reached his 3rd final of the 2015 Island Championships and he will square off against 2nd seed Ian Fitchet in Saturday's final. Elliott was most at threat in his opening match of the tournament against Len Bretel, who opened up a 2-0 lead before going down in 6 games. Elliott's semi final opponent was Keith Opie, whom he dispatched 4-1. Fitchet reached the semis without dropping an end, but he was extended to 6 games here by 3rd seed Maurice James.